General Hospital Spoilers: Avery’s Paternity Called Into Question In Custody War – Sonny’s Not The Dad, Morgan Is? 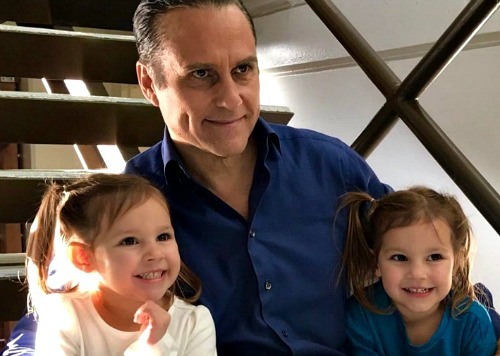 General Hospital spoilers tease that part of Scott Baldwin’s (Kin Shriner) bag of legal tricks in the custody war is to determine little Avery Corinthos’ (Ava and Grace Scarola) paternity. Even though the timing of Ava Jerome’s (Maura West) pregnancy was right for Sonny Corinthos (Maurice Benard) to be the father, she was fooling around with his son Morgan (Bryan Craig) at the same time! General Hospital viewers will recall that in 2014, when little Avery was born, there had been a previous paternity test of an odd sort that tested Carly Corinthos’ (Laura Wright) blood. This test, performed by Dr. Silas Clay (Michael Easton) at that time showed Sonny was the father, because Carly’s DNA didn’t match with Avery’s. Since Carly is not related to Avery, it wouldn’t take rocket science to come to that conclusion, but there was a method to the madness… the idea was to test Avery’s DNA with someone who was either clearly related to her or not, and Silas chose Carly, Morgan’s mother. The theory was since she was related to Morgan but not Sonny, if Morgan were Avery’s father, then Carly’s DNA should have matched Avery’s. However, Silas appears to have missed a vital part of the testing… according to standard paternity test science and procedures when the potential fathers are related, in particular if they are father and son. Both Sonny and Morgan’s DNA should have been tested with Avery’s at the time, and Ava’s DNA as well. Nothing in any of the recaps of that GH episode indicates that either Morgan or Sonny’s DNA was tested, only Carly’s. However, long time General Hospital viewers may remember the circumstances surrounding Morgan’s birth and the question of Morgan’s OWN paternity. General Hospital historical recaps from that time period in October 2003 do not reveal if Morgan’s paternity was ever tested. When Morgan was conceived, Ric Lansing (Rick Hearst) who happens to be Sonny’s HALF brother, had had a heavy flirtation with Carly, and in fact had planned to kidnap Morgan at birth and give him to his wife at that time, Elizabeth Webber (Rebecca Herbst) who had miscarried in a fall down the stairs. Could Morgan have been Ric’s son and not Sonny’s? So, with Morgan no longer available to have his own DNA tested with Avery’s, Scotty may decide to have her DNA tested with Sonny’s (no court order will be needed for that, Sonny will fully cooperate!) and Molly Lansing’s (Haley Pullos) since Molly is Ric’s daughter. If Molly’s and Avery’s DNA show matches, then that will indicate that Morgan must have been the father, not Sonny! Do you think Avery’s paternity will be brought up in the custody battle that’s brewing. Stay tuned to the ABC soap and don’t forget to check CDL often for the latest General Hospital spoilers, updates and news.